Originally posted: March 18, 2019 . Last modified: March 23, 2019 . 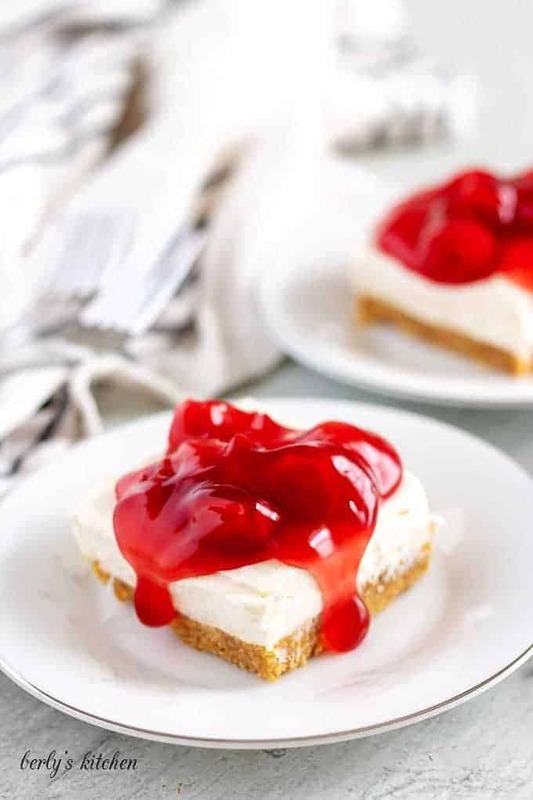 Our favorite cheesecake bars, made with a homemade no-bake filling, a simple graham cracker crust, and finished with a sweet and tart cherry topping. It has begun. Every Spring, I go a little crazy for no-bake cheesecakes. Now, I know I haven’t put one on the blog yet, but there’s a reason why I’ve been waiting. I wanted to get the formula just right. These cherry cheesecake bars have been a long time in the making. Normally, I do everything homemade (except for the graham crackers). But, that doesn’t always go over well with our readers. So, I wanted to make a no-bake cheesecake recipe that was a mixture of store-bought and homemade. Enter these cheesecake bars. The no-bake filling is made using cream cheese and heavy cream. While the cherry topping is from a can. Hopefully, I struck a good balance. Without further delay, let’s get started! First things first, preheat your oven to 350 degrees F. See, that’s why I didn’t call the recipe no-bake. You do have to bake the crust. After that, spray an eight by eight (8×8) inch baking dish with non-stick cooking spray. Next, melt the butter in your microwave and grab a large mixing bowl. In that bowl, combine the graham cracker crumbs, melted butter, sugar, and cinnamon. A fork or your finger, work(s) really well for this part. Once mixed, press the crust into the bottom of the baking dish. Bake the crust for seven (7) to ten (10) minutes. Then, remove it from the oven and set it in your fridge to chill. 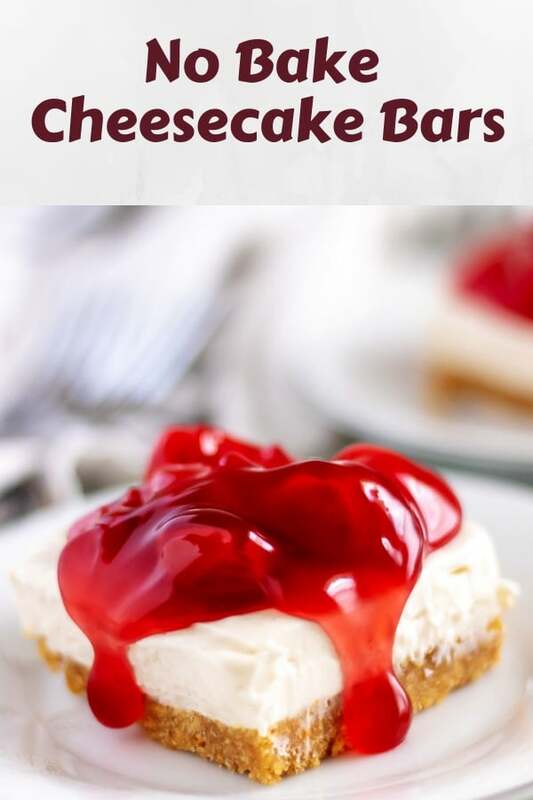 The cheesecake bars are made from a no-bake recipe that does not use Cool-Whip or whipped topped. Instead, we’re going to make whipped cream the old fashioned way. However, let’s start with the cream cheese mixture. Using a stand mixer or large mixing bowl and hand mixer, combine the cream cheese, sugar, vanilla extract, and ground cinnamon. Whip everything together for two (2) to three (3) minutes and set it aside. Afterward, wash and dry the stand mixer bowl or grab another clean one. It’s time to make whipped cream for your cheesecake filling. In that bowl, combine the heavy cream and powdered sugar. All in all, it may take up to five (5) minutes for the heavy cream to reach the “stiff peaks,” stage. Kind of like making meringue. When the whipped cream is done. You can fold it into the cream cheese and sugar concoction. 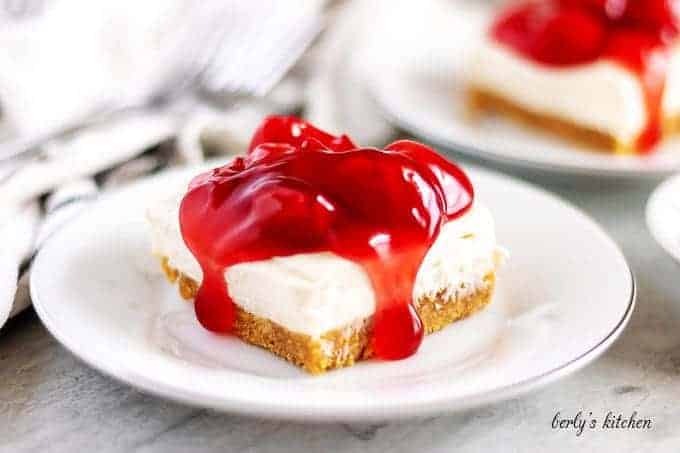 The result is a light and fluffy no-bake cheesecake filling. Take that filling and gently pour it into the cooled baking dish. Use a spatula or spoon to smooth out the cheesecake bars. The hardest part has arrived. You must now place the cheesecake bars into your fridge to set. That usually takes around one (1) to two (2) hours. They will soft-set after an hour. With that being said, they won’t hold up to a heavy topping until the bars have fully set. Alright, two (2) hours have passed and you’re ready to for that cherry pie filling. Open the can and carefully spoon it over the cheesecake bars. 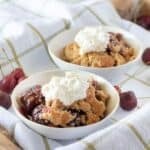 Personally, I use a large kitchen spoon for this step and it works well enough to scoop and smooth out the topping. At this point, you can either return the bars to the fridge and let the topping set or you can slice and serve them as is. It’s up to you. All that matters is that you enjoy the recipe. If you want to cut down on the overall, “cook,” time, you have a couple of options. 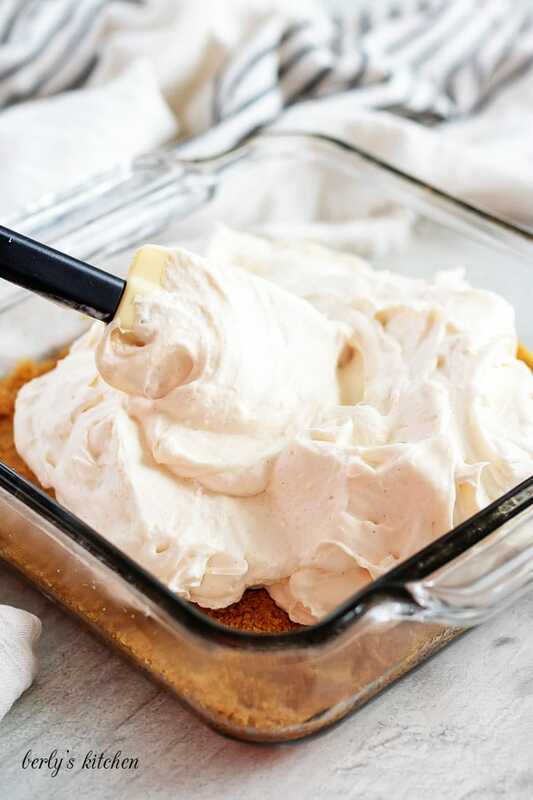 For example, you can substitute Cool Whip or whipped topping for the whipped cream. Additionally, you can buy a graham cracker crust to avoid baking your own. When making my cheesecake bars, I use a homemade fruit topping. Which, basically consists of fruit, sugar, and a couple of tablespoons of water. Cook the mixture down over medium heat and chill it before using it on the no-bake cheesecake filling. A friend of ours tried the finished recipe and she stated they were not as sweet as she expected, but had a good balance. On the chance you want them sweeter, then taste test the filling after it’s been combined and add sugar as needed (and stir it, of course). 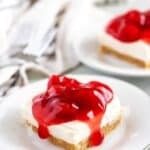 If you enjoyed our cherry cheesecake bars recipe, please leave us a comment and rate the recipe card. You can also find us on Facebook, Pinterest, Twitter, and Instagram by searching for Berly’s Kitchen! Preheat oven to 350 degrees F. and grease an 8 by 8 inch baking dish. 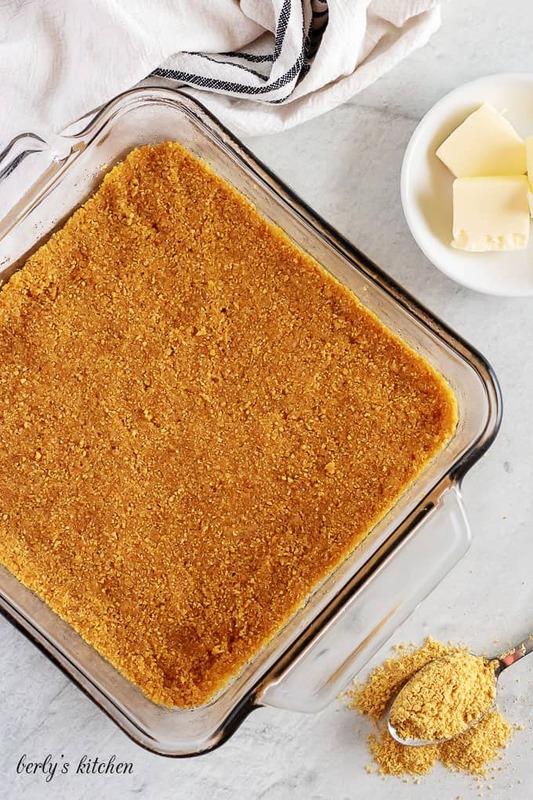 In large bowl, combine the melted butter, sugar, cinnamon, and graham cracker crumbs. Once mixed, press the crust into the bottom of the pan and bake it for seven to ten (7-10) minutes. When done, place it in your fridge to cool. 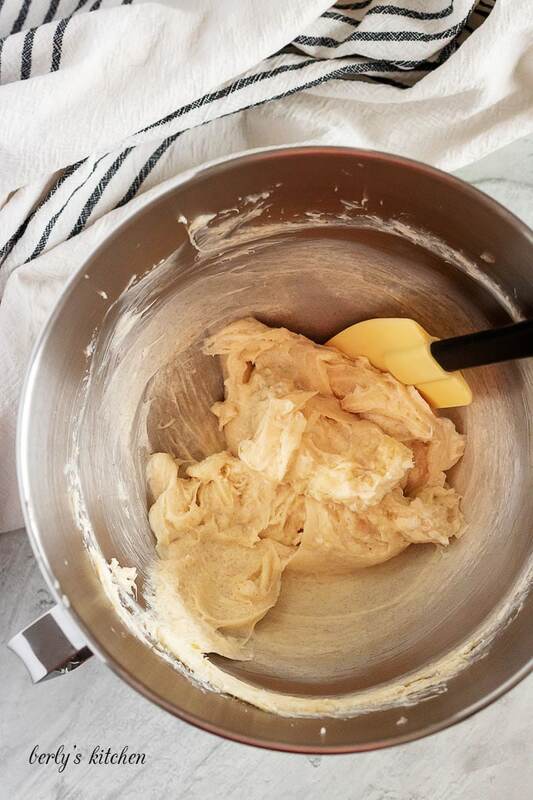 Using a mixer, combine the cream cheese, sugar, vanilla extract, and ground cinnamon. Mix for two to three (2-3) minutes. Set aside. Grab another bowl and combine the heavy cream and powdered sugar. Mix until whipped cream forms stiff peaks Approximately, five (5) minutes. 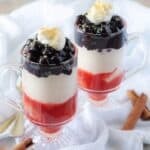 Fold the whipped cream and cream mixture together to create no bake filling. Pour the filling into the crust and use a spoon to smooth it out. Place the cheesecake in your fridge to set for about two (2) hours. When the cheesecake has set, gently top it with the cherry pie filling and use your spoon to smooth out the topping. Cut the bars into twelve (12) equal sized servings and serve or put them back into the fridge to store. The calories listed are an approximation based on the ingredients and serving size of one (1) bar (when cut into twelve ((12)) equal sized bars). Actual calories will vary. The cherry cheesecake bars can be stored in your fridge in a sealed container for up to three (3) days.